Make these miniature and dolls' house scale animals from a number of materials. They can be used in scale scenes, in a dolls house, or used as decorations. Pick a method and an animal and start your own collection! 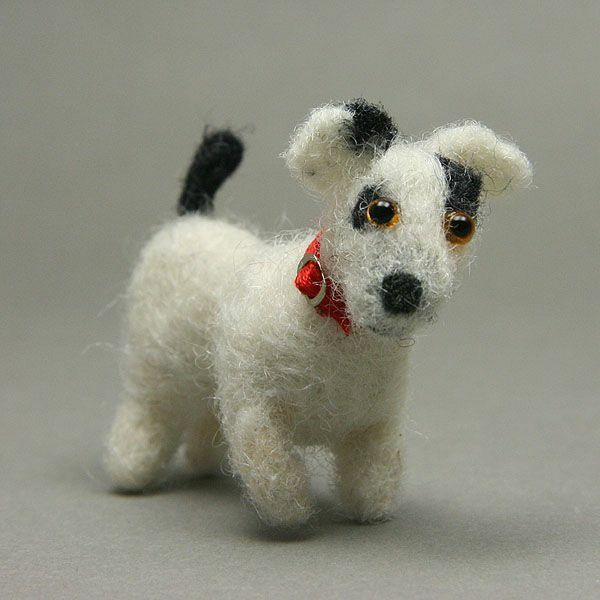 Dogs with a great deal of personality and accurate or stylized coats are fairly simple to make using needlefelt techniques and wool, silk or mohair roving (unspun fiber). As the needles used are very sharp, this is not a technique recommended for children. The dogs can be made in many scale sizes, depending on the wire armature used and the type of fiber. Silk roving is best for smaller animals (1:24 and less). Use simple needlefelting techniques to make a lamb a flock of sheep. Basic wool roving to make the sheep can be found in most yarn or knitting and weaving shops. This particular sheep was made in 1:24 scale to fit a friend's model railroad scene. The cat shown here was made as a stray for a Halloween scene, but you can use this tutorial to fashion a range of pampered pet cats which can be posed stalking, at play, or simply sleeping. Short haired breeds are easier for beginners to make, but long-haired cats can be made using the instructions for the raccoon that show adding longer fur. This miniature mouse can be used as a poseable character for miniature scenes as it is roughly adult sized in 1:24 or 'half' scale. It also makes a great decoration. Make it without the wire armature, and use stitched facial details instead of beads, if you want it for a child's play situation. Butterfly Koi are fairly easy to make from polymer clay. You can pose them in a fish pond or use them for miniature jewelry. The color patterns of Koi make them easy to mimic in small scales, plus they show up well in simple water pools made with a water 'surface' of sheet plastic. Another easy to make project, the miniature bird's nest uses thread and bits of moss. Tiny eggs can be made from polymer clay to fill the nest. Make sure you research what your chosen bird's eggs look like! These chicks are designed for dolls house scale Easter baskets, but you can pose them in nests in the hen house, or chicken coop as well. They are made from tiny pom poms​ and are easy to make if you can manipulate small items using tweezers. These white doves can be made for wedding decorations or favors as well as for scale scenes. The white doves used at weddings are actually white racing or homing pigeons. These doves are made using similar methods to the seagull. The ones shown are made from air dry clay, but they can also be made from ​two-part epoxy or polymer clay. These crows can be made from a polymer or air dry clay. Change the size if you want ravens, which are much larger than crows. You can use feathers and flocking to make these tiny birds even more realistic. This stuffed bear is 2 1/2 inches tall, with moveable arms and legs. Although it requires patience to sew and turn, it is an easy pattern for a first stuffed miniature bear. Made of felt, it can be made from sueded fabrics or short pile upholstery fabric to give it more 'fur' as you become a more experienced stuffed toy maker.